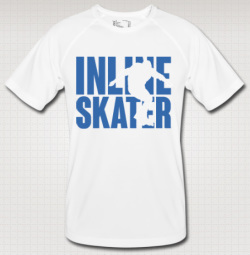 Mens t-shirt for peak performances in Inline Street Skating. The breathable mesh fabrics transpire condensed moisture to the outside and prevent the t-shirt from sticking to your body in the Cyprus heat. It is fashioned to guarantee optimal freedom of movement and comfort wear: the arms are tailored raglan style without any annoying shoulder seams, and the care instructions are not put on an extra tag but printed inside to avoid itching. 100% polyester. Small, medium, large. Men's specific shape t-shirt. LSS logs on right sleeve and back center neckline. 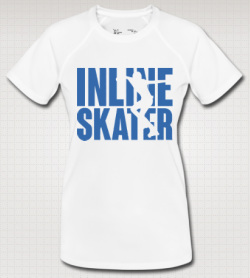 Ladies t-shirt for peak performances in Inline Street Skating. The breathable mesh fabrics transpire condensed moisture to the outside and prevent the t-shirt from sticking to your body in the Cyprus heat. It is fashioned to guarantee optimal freedom of movement and comfort wear: the arms are tailored raglan style without any annoying shoulder seams, and the care instructions are not put on an extra tag but printed inside to avoid itching. 100% polyester. Small, medium, large. Ladies specific shape t-shirt and artwork design. Ladies Official Cyprus Skate Marathon t'shirt made by American Apparel. 100% cotton, a beautifully made street fashion t'shirt. Small, medium, large. Ladies specific shape. Mens Official Cyprus Skate Marathon t'shirt made by American Apparel. Small, medium, large and ex large. Mens specific shape t-shirt.